Preparing artichokes is a little fiddly – the important thing to remember is that, once cut into, they go brown really quickly. So the trick is to have some lemon halves to hand and also a bowl of water, laced with lemon juice. Once you have exposed any of the inner parts of the artichoke, rub it with lemon juice and then pop the prepared artichokes in the bowl of lemon-water until you are ready to cook them. With the small, purple artichokes, the best thing is to pull off the outer leaves until you expose the pale inner leaves. Next, slice across the top of each artichoke, just to take off those spiky tips and rub over with lemon juice. Artichokes have, at their core, a fibrous ‘choke’ that needs to be removed. In the big globe ones the ‘choke’ is quite tough, in the smaller varieties, the ‘choke’ is more like silky tufts. 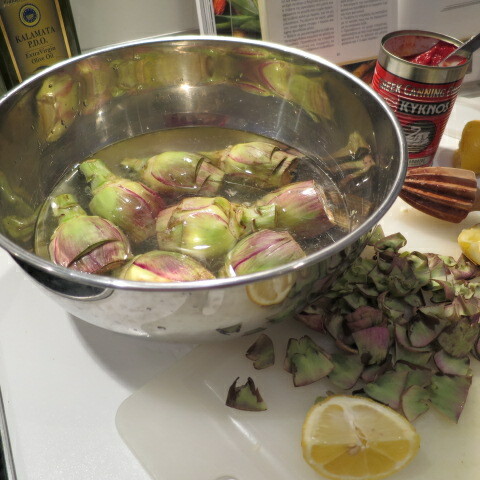 Cut the small artichokes in half lengthwise, exposing the ‘choke’ and scoop it out. 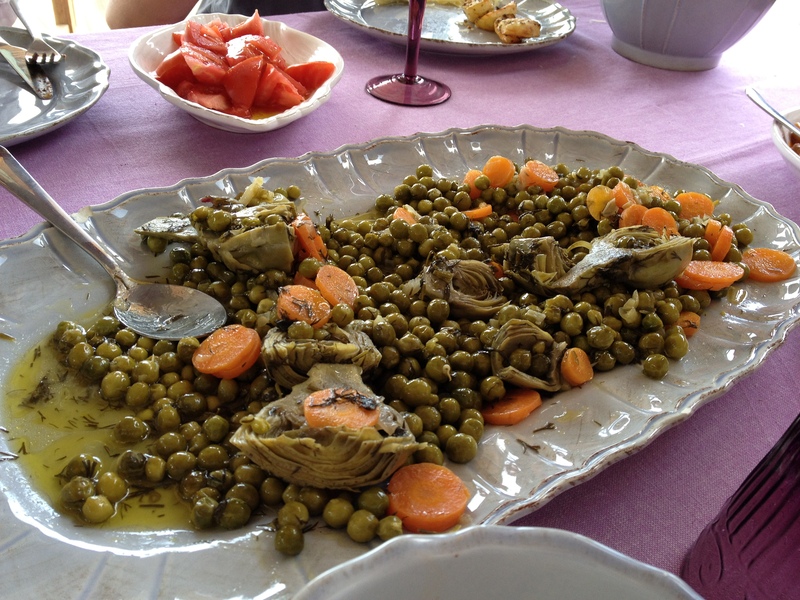 Remember to keep the prepared artichokes in the lemon-water until you are ready to cook them.